“Since the Soul Renewal Journey it’s been an intense year of growth and clarity — truly the best year of my life. The world feels like a lighter place. I’m present more and able to recognize the beauty around me. I still have the same problems but I look at them differently now.” Denise S.
“I went on the Canyon de Chelly journey to disconnect from the roar of my life and get a chance to be filled by the beauty and silence of the canyon. Suffice it to say that I loved the trip. The peak moment for me was the morning we spent at the base of Spider Rock. We climbed up this wall next to it and looked over the canyon with Spider Rock to our right. Everything stopped. I was completely present in that moment, and I felt on a deep level that I was connected to something much greater than myself. For me, the things in my life that were causing me angst fell away. I experienced a deep and wondrous love for the gift of this life.” Matthew M.
“I felt a sense of intense honesty and presence. It was so pure, really profound. We can feel fully accepted in nature — it’s such a gift. Everyone should have this. Since the journey I’ve been more intentional about gratitude and I’ve been able to maintain it more than before. I’m more compassionate with myself, calmer, and able to handle my challenges better now. During the journey you all supported me very well, from helping me prepare with the pre-trip checklist to giving me personal attention when I needed it.” Anita A. “The 24-hour solo work was very moving and meaningful. The full scope of the experience was facilitated by Larry and Cheryl’s gentle guidance and profound wisdom in wilderness work. Through the developing and expanded sense of perceptual clarity, there was a sense of openness and attentiveness to recognize and discover personal insights and the overwhelming sense of connectedness. 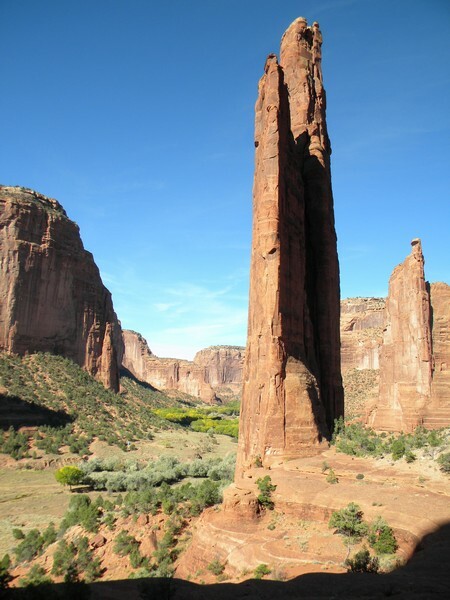 I treasure these moments shared with the group, each of whom identified profound new awarenesses previously hidden.” Tom R.
“I had the opportunity to join Lead Feather’s trip to Canyon de Chelly and am so pleased I took the chance! Canyon de Chelly is beautiful and it felt magical being there. Cheryl, Larry and Dotty had everything organized beautifully, and I felt so taken care of. This gentle holding that they provided, and mirrored by being held in this beautiful canyon, gave so much more than relaxation. As the everyday worries gently unraveled, I felt more myself than I had in a while. There was a sense of kindness and acceptance in this holding that allowed me to feel that my authentic self could manifest more and meet the energies present. The authentic place that I was able to meet within myself is continuing to unfold, and all I have to do is imagine myself at the base of Spider Rock and the gifts from the trip continue then to be present and expand. I am so grateful that I had this experience, it ended up being so much more than I could have imagined.” Lynn L.
“I get to spend a lot of time reflecting in my life, so I actually wasn’t sure what else I’d get from a 24-hour solo. As soon as we arrived, though, it started working on me. 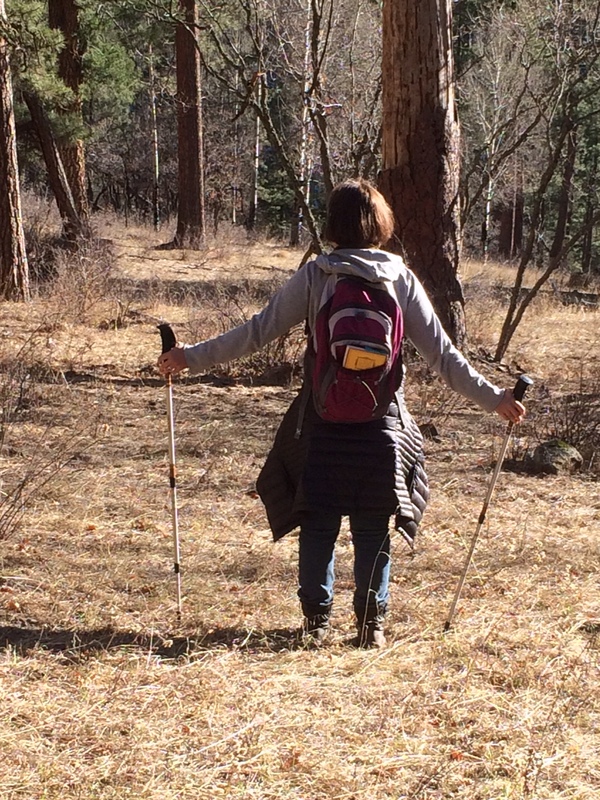 Slowing down, giving myself permission to explore, not being so goal-oriented….actually allowing myself to play. It turned out to be really powerful.” Melinda C.
“Your faith in the participants is unmistakable. I felt very supported and that meant a lot to me. It was great that you created so many ways for people to have their own experience. Camping at Spider Rock was a highlight. I also loved the solo time and the ability to explore on our own.” Liz M.
“My deepest affinity is with nature. It is the one thing I have the deepest longing to connect with outside of the people who I love. For me, only good things come from spending some time alone in nature. Larry and Cheryl thoughtfully guide small groups of new and old friends into simple and profound encounters with primal nature. Within just a few days, magic and transformation occurred for me on the Journey.” Stephen A. “The most loving thank you to Cheryl and Lead Feather for creating a special journey to the sacred Canyon de Chelly and reconnecting me to both Mother Nature and my Native American ancestry. Most surprisingly this endearing journey helped me rediscover my inspiring inner child deep inside my soul! Experiencing the nature and culture of Canyon de Chelly, along with the magnificent beauty and breathtaking sheer canyon walls, I enjoyed hiking and camping in the remote location, feeling the warmth of the fire, stargazing with zero light pollution and sharing stories of peace. Not only a photographer’s dream come true but the trip of a lifetime that will always have a very special place in my heart, forever reminding me to experience nature every single day and acknowledge the little girl inside me laughing and loving life to the fullest!” Katrina F.
“The Soul Renewal journey was the best self-reflective, confidence building, grounding, outdoor experience I’ve ever been a part of. You and Larry have a very keen sense of how to guide someone through a journey without being at all overbearing. I felt totally supported in exploring my confidence and getting inside my head, but didn’t feel “pushed” or “directed” to a particular place. I also think being able to share experiences within the group was awesome, whether it was during a camp fire, having breakfast or just hanging around camp. When you hear about the experience of others, it helps you to connect better with your own. The journey was very well organized. Everything seemed flawless, from rides to food to extra camping equipment. That’s important because I didn’t have to “worry” about those things and was able to just focus on my journey. I feel like I was with the perfect group of people, everyone was super supportive and I was able to connect with each person in different ways, so I am incredibly thankful for that. Finally, the fires were truly awesome and (I mean AWE). I knew they were special at the time, but I find as time passes, I connect with them more. I mean, fire is life and you know that stuff never stops. How incredible is that? And just knowing that this group of people was able to set aside “day-to-day” to really meet each other on this spiritual, endless, real level, how often does that happen and what an incredible gift! I feel like every part of the journey benefited me in so many ways. I hope do be able to do this again soon!” Liz H.
“I am not a magical thinker. I am an experienced outdoorsman. My endorsement is for people like me. The solo camping in the Soul Renewal Journey is a remarkable experience which combines breathtaking settings and a supportive, deeply spiritual group of people (fellow campers and support staff). I was unprepared for the empowering and uplifting effect my two solo nights in the wild had on me. I can’t recommend it strongly enough. And I can’t wait for my next trip! In addition, our family has participated in several Family Journeys. Logistically they are thoroughly well-planned and carried out by a wonderful support staff. Truly it is the easiest (and probably the most fun) camping experience you will ever have. The Native American leaders are wonderful people who create a spiritual atmosphere that imbues the entire experience with unexpected meaning. After the first talking circle the entire group suddenly feels like one big family.” Alan S.